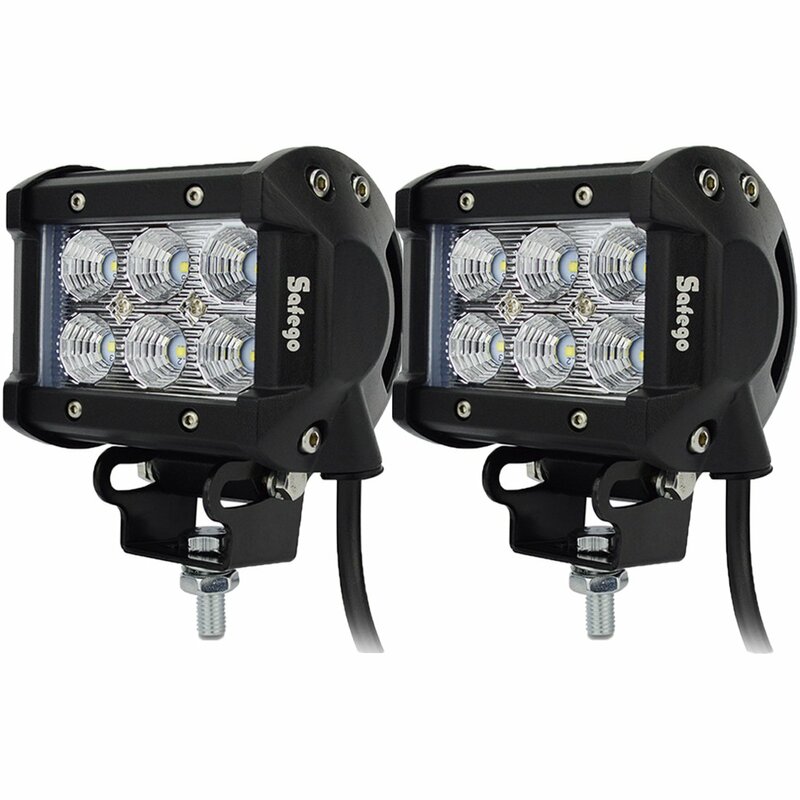 Home › Energy-Efficient LED Lighting › Safego 4"Inch 18W Led Work Light Bar Offroad Flood 4X4 4Wd Car For Trucks Atv..
60 Degree Flood beam, Waterproof and Shakeproof. Size:Flood (60 Degree) Specification: 1.Operating Voltage: DC 12V /24V(DC10-30V) 2.LED: 6pcs3w High intensity CREE LEDs Theoretical Wattage18W2W. Operating Wattage: 152W 3.Light Color: White, Color Temperature:6000K~6500K 4.Theoretical Lumens:1800lm200lm. Operating Lumens 1360lm200lm5.Housing Material: Diecast Aluminum Alloy. 6.Surface Lens material:PMMA or PC7.Mounting Bracket:Stainless Steel 8.Light Beam: Flood beam, 60 degree9.Lifetime: 30000 hours 10.Warranty: 1 Year Whats in the Package? 2PCS 18WLED Work light 2PCS Mounting bracket Screws Applications: 1. Off-roadVehicles: 4X4, 4WD, ATV, SUV, UTE, Boat, Jeep, Truck, Tractor, Trailer, Buggy,Train, Car, Auto, Motor, Motorcycle, Motorbike, Bus, Tanks, Sand Rail and etc.2. Engineering vehicles: excavator, road roller, bulldozer, crane,fork liftand mining truck etc. 3. Specialized vehicles: fire engine, police car, rescuevehicle, communication vehicle, military command vehicle etc. 4. Others:Fishing, Courtyard Lamp, Yacht, Road/Street lamp,etc.